Lutsk, Russia, 25 June 1941: Operation Barbarossa called for a rapid German thrust to Kiev, after which the panzers would swing south and trap the bulk of the Southwestern Front. The road nexus at Lutsk was crucial to this drive. The Southwest Front commander had been ordered to counterattack the Germans immediately, but operations were severely hampered by both the Luftwaffe and the poor mechanical condition of the Russian vehicles. the Germans, however, were not hesitating. Panzer-Division 13 hit the 22nd Mechanized Corps in front of Lutsk at dawn. A savage battle persisted all day and while the German armour outclassed the Russian BTs, the panzer crews could only watch helplessly as their shells bounced off the thick armour of the monstrous KV-2s. Finally, in the fading daylight, the Germans broke into Lutsk, forcing the Soviets to evacuate the town. The valiant 22nd had bought time enough to allow troops to move into position around Rovno, but had paid dearly for it. Sid, Yugoslavia, 18 January 1945: Operation Frulingstorm was the major offensive along the Syrmien front south of the Danube spearheaded by the 7th Gerbigs (Mountain) Division - long considered a "stepchild" of the Waffen SS and eager to prove its worth. Opposing this assault were six divisions of Marshall Tito's "partisan" army. As the Reich was crumbling, Tito's once rag-tag forces were beginning to resemble regular armies, complete with everything from organisation to artillery. Dug-in like the Russians who trained them and backed by Soviet air power, Tito's men were anxious to prove they had grown into a legitimate military force. For almost four full years, from June 1941 to May 1945, the biggest battles of the Second World War raged across Eastern Europe. Nazi Germany chased the Red Army to Leningrad, Moscow and Stalingrad, and in turn it was pushed back through conquered territory and client states and into the heart of Germany. Most people have heard of Kursk, Prokhovka, Kharkov and Warsaw, but history was also made at less well-known places such as Lutsk, Taranovka, Storozhevoe, and Sid. East Front is the fifth "action pack" for Advanced Squad Leader and contains three new ASL geomorphic map-boards - boards 56, 57 and 58. It features twelve new scenarios which depict actions involving German, Russian, Slovakian, Romanian and Partisan forces in action throughout the theatre from June 1941 to April 1945. 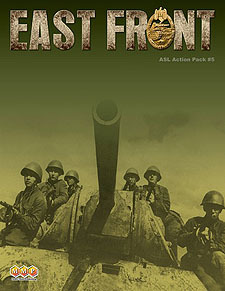 Designed for the aficionado, East Front is not a complete product and assumes the buyer owns the core Advanced Squad Leader game system.